Justinmind, a fantastic prototyping tool for websites and apps, has just released a new integration with Loop11 which makes testing your design a breeze. Below we lay out the simple steps. In order to follow this tutorial, you will need both a Justinmind account and a Loop11 account. Both offer free trials. First up, you need your Justinmind designed prototype. If you’ve just started out they’ve helpfully provided example projects which you can download and play with. From within Justinmind, share your project so that it is sent to the cloud. Then you jump over to justinmind.com and Sign In. Once logged in you’ll see you project(s) on the dashboard. Click on your project’s name, highlighted in the below screenshot. Next, click on the Actions dropdown link and then click on Integrate with usability testing tools. A pop-up will then appear. From the pop-up, select the radio button next to Loop11 and paste in your Loop11 code then click Save, as shown in the below screenshot. If you haven’t already got your Loop11 code, you can find it either once you’ve designed and launched your Loop11 project or within My Account when logged in to Loop11. You prototype is now set-up and ready to run a Loop11 user test. 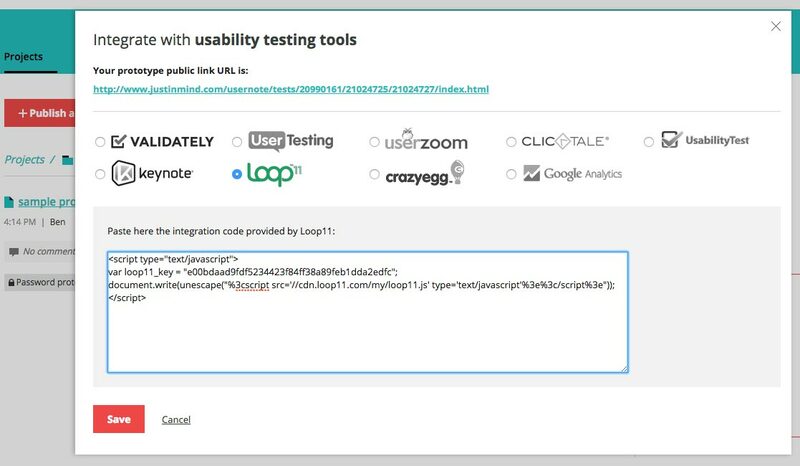 While setting up your user test you may well need to find the start URL for your project. To find this within Justinmind click on Get Link. This will launch a pop-up showing your prototype’s URL. This step is shown below. Once you have launched your Loop11 test, Loop11 will provide you with the URL that should be given to participants. It is a combination of the Justinmind URL (shown above) and a little bit that Loop11 adds to the end. If you don’t use Loop11’s start URL and instead use the Justinmind URL then the Loop11 project will not launch. Happy testing, and as usual, if you have any questions a member of our support team would love to help you out.